If you saw my blog about Paris, then you probably knew that Rome was the 2nd part of the trip. 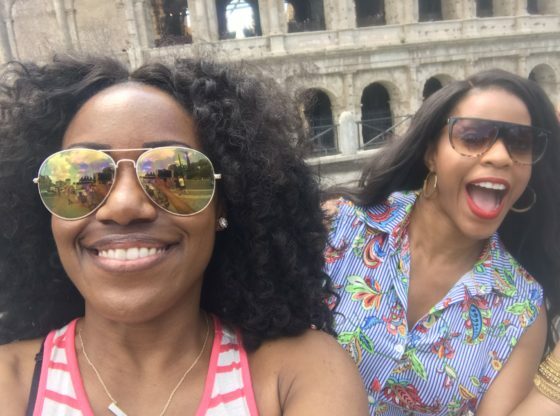 I arrived in Rome on my birthday May 23rd, to surprise my BFF for her bday as well. It was awesome. She had no idea we were coming! Her husband masterminded the entire surprise from beginning to end. She thought she was just going to accompany him on his vacation. However, we had OTHER plans! Check out my Vlog for the action and surprises! In Rome, we opted for an Airbnb. I searched travel groups for the best Airbnb in Rome for the size of our party. We were mainly looking for a great location, with 3 beds and air conditioning. The airbnb we found was perfect. We were extremely close to shops, restaurants and the Colosseum. We were also steps away from a bus station as well. Rome was an adventure. We got lost several times during this trip. I have never been so lost while vacationing. This dwindled our time down but we still managed to see quite a few things. We were able to see the Colosseum, Vatican, Spanish Steps, Trevi Fountain, and more. I didn’t do much shopping, but, I was able to score a pair of beautiful cobalt blue pair of Italian leather gloves. I can’t wait for the weather to change so that I can wear them! 1. Bring clothes to cover your knees and shoulders if you plan on visiting the Vatican. In some places, they have items they will loan you during your visit to cover up. The Vatican does not offer that. You will be denied entry. Side note about the Vatican, go early and book in advance. The wait times are crazy. 2. There were several double decker tour bus companies. The best choice is the Big Bus Rome. It’s a few dollars more, however, they run a bit more frequently and visit more stops. Trust me, the other companies are subpar. 3. Bring Euro in change. Some places charge for bathrooms. 4. Businesses close at very odd times in Rome. Double check the times before you plan to go. 5. There are no face towels in Rome. I know face towels are standard in the US but not in Rome. 6. If you book an Airbnb, be careful with the door locking mechanisms. It’s different than the US. We were locked INSIDE of our Airbnb for an hour. The hosts sister, had to come and let us out. If someone locks the door from the outside, you will be locked inside. This seems like a major fire hazard, but apparently, that’s how it is there. 7. Bring a converter and check the voltages ahead of time for electrical outlets. 8. Many places in Rome do not have air conditioners. Be prepared if you visit in the summer. 9. Also, many places don’t have clothes dryers. They hang their clothes to dry. Every once in a while, on vacation I wash clothes, especially if I’ve been somewhere “adventurous”. I don’t want to bring that “adventure” back in my suitcase. So, check on the dryers. You may have to give your clothes time to wash and dry. 10. A fellow traveler informed me of this AFTER I got back, but, there is a hotel next to the Trevi fountain. If you go to that hotel and tip the concierge, they will take you to the top of the hotel and you will get a BEAUTIFUL view of the Trevi fountain at night. Bonus Tip: If you want pics in front of the Trevi Fountain without hundreds of tourists, you have to go in the middle of the night. During the day it is swarming and almost impossible!